ReNu Multi-Purpose Solution by Bausch & Lomb is an exceptional and reliable multi-purpose contact lens solution that offers value for money and saves you time during your daily contact lens cleaning routine, without compromising on hygiene or quality. 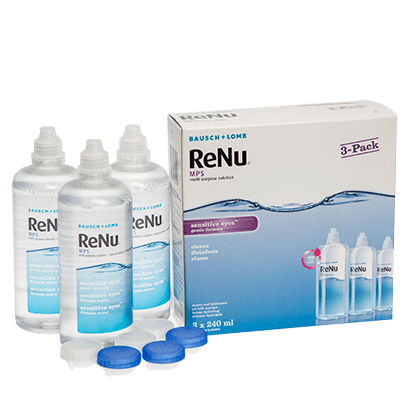 ReNu Multi-Purpose Solution Triple Pack is loaded with three 250ml bottles of contact lens solution and three contact lens cases, giving you enough contact lens solution to look after your contact lenses for at least three months. There’s no need to buy multiple contact lens cleaning products and contact lens cases when you can add ReNu Multi-Purpose Solution Triple Pack to your contact lens care routine. The multi-purpose contact lens solution will evenly clean, rinse, wet and store your two weekly or monthly contact lenses. For more information on how to clean and store your lenses, read our helpful guide. The solution not only eliminates lipids and other deposits that have built up during the day, but rehydrates the lens material and keeps your eyes feeling moisturised for an increased period of time. This is perfect for those who suffer from dry eyes. Your contact lenses will retain the very same fresh and smooth feeling you get the first time you wore them when you use this multi-purpose solution. We also stock a one month supply of ReNu Multi-Purpose Solution and a smaller-sized flight pack, as part of our renowned ReNu range. Nice product if you have sensitive eyes. I like this contact lenses solution. The packaging is nice, good size and the contact lenses are feeling comfortable with this solution. The price of this product is amazing. On the high street I would get one bottle for a little less than I pay for three. Very reliable, been using this product for two years now and have never had a problem with it. Good product, prompt delivery, will use again. Product as expected, cheaper than the ones in the high street, reliable brand, good quality, no fault! Just started using this product, but very happy with it - no more dry eyes with contact lenses! Best purchase I''ve done in a while. Fast dispatch and excellent quality, definitely will use your products again. The best solution I have used in over twenty years of contact lens wearing. I can wear lenses for long periods, even night shifts, and they never dry out anymore. Fit for purpose, comfortable and easy to use. I bought this product as i was told it was the best on the market and i have to say it was worth every penny i will be ordering again. The Bausch & Lomb Renu is a product I have used for many years without any problem. And will continue to do so.